BOONVILLE, Mo. — Lewis and Susan Miller refer to “Mitch” as if he were a family member. In some ways, he is. “Mitch” is a 1913 Mitchell Touring car, a car built by a company started by Miller’s great-great-great-grandfather, Henry Mitchell. Mitchell was born in Scotland in 1810, and he moved to America in 1834. He and his wife Margaret settled in Fort Dearborn, which later became Chicago. Mitchell, a wheelwright, built the first wagon ever made in Chicago. Mitchell and his wife settled in Racine, Wis., in 1855. By 1877, the Mitchell & Lewis Co. was one of the largest and best-equipped wagon makers in the country. The company had 7,200 employees and made between more than 8,000 wagons a year. They were exported all over the world. Henry Mitchell died in 1893. William Turnor Lewis, his son-in-law, took over the Mitchell co mpany. His son, William Mitchell Lewis, or Uncle Bill as the family called him, started producing motorcycles. 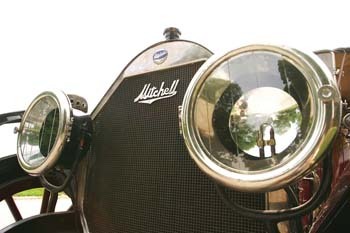 Six hundred Mitchell motorcycles were built in 1902. In 1903, the Mitchell Motor Car Co. built its first automobile. That was the same year as Henry Ford’s first car. 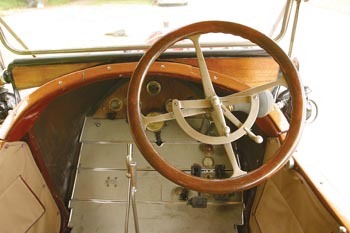 Lewis’ 1913 Touring car had a 600-cubic-inch, six-cylinder engine that produced 50 horsepower. 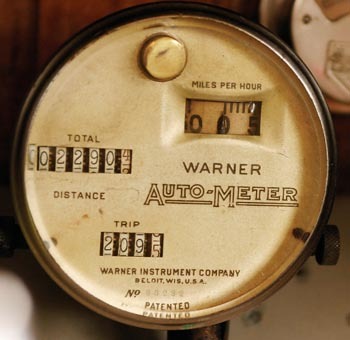 The car sold for $1,850, which would be equivalent to $33,000 today. In many ways, it was quite advanced for the time. 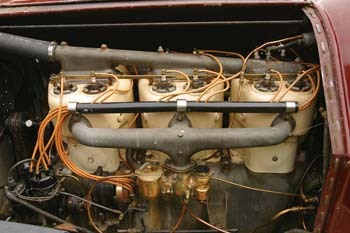 It had two spark plugs for each cylinder and both a magneto and a distributor. If the battery failed, the driver could switch over and drive the car using the magneto to create a spark. The lights were both carbide and kerosene. Miller grew up in Boonville but lived most of his adult life in Clinton, Mo. He and his wife moved back to Boonville in 1994 to care for his mother, Marilew Miller. Even though Miller has been a mechanic, he was not particularly interested in Mitchell cars until he visited the museum in Racine, Wis., a couple of years ago. The enormity of the factory made him realize how important Mitchell cars were. 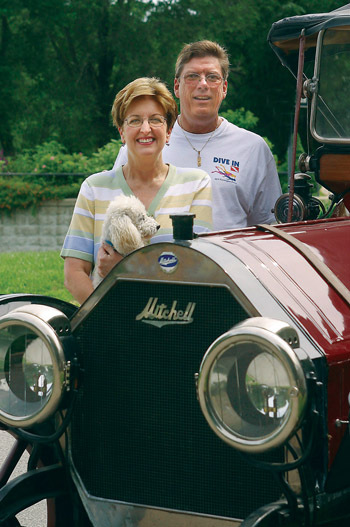 About 150 Mitchell cars still exist, and their owners formed a club last year to celebrate the brand’s 100-year anniversary. When Miller located “Mitch” last year in St. Louis, the person who owned it was ready to put it on a truck bound for an auction. Miller drove immediately to St. Louis and bought the car on the spot. “Mitch” was originally found in pieces in Florida 30 years ago and although its restoration is a bit dated, it still looks great. 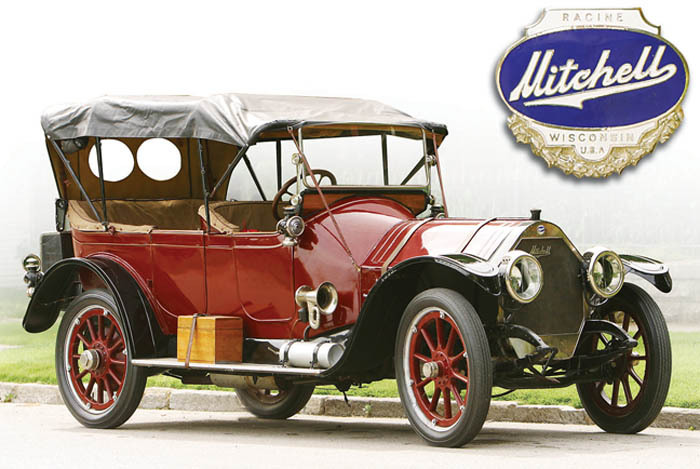 Miller has since purchased a 1911 Mitchell R-series roadster as well as two Mitchell wagons from the late 1800s. He plans to leave one of each to his children, Michelle Lew and Lewis Keith. “Throw it wide open, I’ll hold on tight. Lewis describes himself as a “late bloomer” because his interest in Mitchell cars is so recent. His wife, Susan, however, has always been a keen student of family genealogy, and now, with the purchase of two cars and two wagons, their involvement in all things Mitchell is in full flower. Lewis and Susan Miller, left, revel in their old car because it is so important to their family's history.